Objectives: Biogeochemical processes in young (i.e. during early diagenesis) sediments are directly connected with the degradation of organic matter. Organic matter may be produced by algae and other organisms in open water, which subsequently sinks to the seabed and becomes incorporated within the sediment. It may also be the remains of plant material such as eelgrass, seaweed or, archaeological materials deposited or incorporated within sediments. 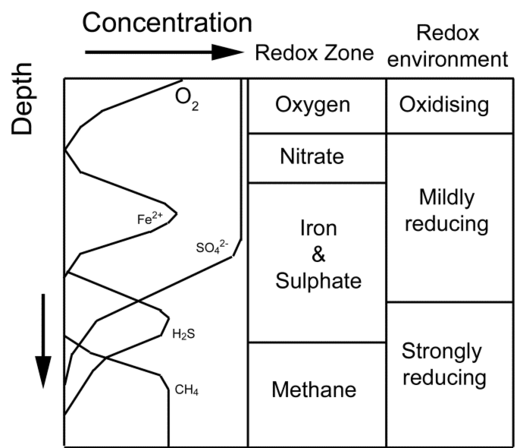 The utilisation (turnover) of the organic matter by organisms within sediments involves oxidation – reduction (Redox) reactions. These reactions follow a well-documented succession (Figure 13) with various chemical species being utilised based on the amount of energy they yield. From the pool of potential electron acceptors, the microbial community selects the one that maximises energy yield from the available substrate. This is partly due to metabolic regulation within a single population and in part due to the competition between several populations with diverse metabolic capabilities. In marine sediments, the sequence of electron acceptor utilisation can be observed spatially in horizontal layers of increasing depth. In typical coastal marine sediment, only the first few millimetres of the sediment are oxygenated, though bioturbation by invertebrates may extend this oxygenated zone downward. For a few centimetres under the oxygenated zone, nitrate serves as the electron acceptor followed by manganese and iron oxides. Below this, sulphate is the principal electron acceptor. Methanogensis, is usually confined to the sulphate depleted deeper sediment layers, though the generated methane may diffuse upward into the zone of sulphate reduction. Thus, the deterioration of organic matter and therefore archaeological artefacts / information still occurs in anoxic environments due to the activity of anaerobic organisms. Assessment of the rate of turnover of organic material is important if we are to assess both the preserving capabilities of marine sediments on archaeological sites and the potential state of preservation of organic archaeological materials. • To establish a best practice method to characterize the preservation potential of sediment on marine archaeological sites. This will be achieved by assessing the rate of turnover of organic material based on information provided by the datalogger and sediment samples and microscopic analysis of waterlogged archaeological wood. • Correlate the data obtained from the sub bottom profiler in WP2 with the environmental data in order to assess the potential of using this system to remotely assess the preserving capabilities of sediments.